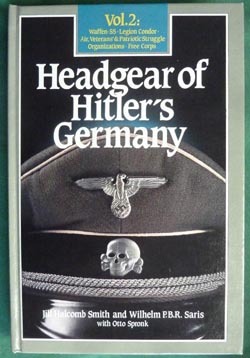 Headgear of Hitler's Germany; Vol. 2: Waffen-SS, Legion Condor, Air, Veterans' & Patriotic Struggle Organizations, Free Corps - by Jill Holcomb Smith and William P.B.R. Saris, with Otto Spronk. Bender Publication - 336 pages - pristine condition - great Reference Book.